But some U.S. states have more economic mobility than others. According to data from the Pew Center on the States, a handful of states—among them Maryland and New Jersey—do much better on a range of mobility measures than the national average, and are almost twice as mobile as some of the worst performing states such as Louisiana, Oklahoma, and South Carolina. But what makes a state more or less mobile? Gov. Daniels and other conservatives may be interested to learn that strengthening labor unions—a group that they have often attacked—would help increase economic mobility. Even a cursory review of the Pew mobility list indicates that union membership seems to affect mobility significantly: Six of the eight most mobile states have high unionization rates—Connecticut, Rhode Island, New Jersey, Utah, Massachusetts, Colorado, and Maryland—and all but 1 of the 10 least mobile states—South Carolina, North Carolina, Mississippi, Arkansas, Tennessee, Alabama, Louisiana, West Virginia, Georgia, and Oklahoma—have low unionization rates and laws that discourage unionization. Indeed, the 10 states with the highest unionization rates—New York, Hawaii, Michigan, New Jersey, Washington, Minnesota, Illinois, Ohio, Wisconsin, and Oregon—perform considerably better on a range of measures of mobility than the 10 states with the lowest levels of unionization —South Carolina, North Carolina, Texas, Arizona, Mississippi, Georgia, Florida, Virginia, New Mexico, and Arkansas. As the charts in this brief highlight, states with high rates of unionization have greater absolute and upward mobility and lower rates of downward mobility than states with lower unionization rates. More advanced analysis further bears out this relationship. According to Center for American Progress Action Fund analysis of data from the Pew Center on the States, states with high union membership rates are more likely to have high levels of economic mobility, even after controlling for other factors such as education, income levels, inequality, and unemployment. Our analysis finds that education is the most important source of mobility—but unionization rates matter quite a bit as well. Increasing the unionization rate in the average state by 10 percentage points—roughly to the level they were in 1980—would be associated with an increase of just under 4 percentage points in the share of the population that is upwardly mobile. This is about two-fifths of the impact of boosting the share of the workforce with a college degree by 10 percentage points. 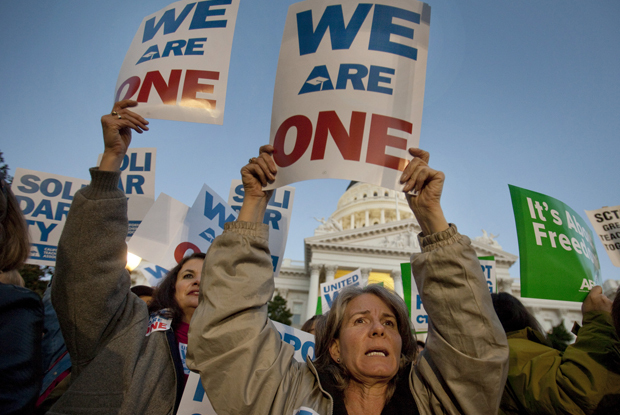 Boosting economic mobility is one more way unions help support the middle class. Our previous research finds that if unionization rates increased by 10 percentage points—to roughly the level they were in 1980—then the typical middle-class household, unionized or not, would earn $1,479 more a year. Harvard University sociology professor Bruce Western and University of Washington sociology professor Jake Rosenfeld find that the decline of unions accounts for one-third of the rise in wage inequality in the United States over the past 30 years. As a result, policymakers that are concerned about boosting mobility and strengthening the middle class should add increasing the strength of organized labor to their list of policy solutions. This issue brief looks at the leading factors that increase economic mobility and then explores how increased unionization is in fact key to increasing mobility. Unions boost economic mobility in several different ways. First, unions help workers negotiate for higher and rising wages. Labor unions are particularly effective at boosting the wages and mobility of young, immigrant, low-wage, and African American workers. Unions also push for increased job training and career ladders, which both help boost mobility over a lifetime. And outside of the workplace, labor unions help get ordinary citizens involved in politics to advocate for public policies that help boost mobility such as the minimum wage and investments in education. States with higher levels of unionization have more generous social safety nets that lift workers up as well as cushion blows. Of course, other factors contribute to economic mobility besides the strength of labor unions. The most commonly cited factor is increasing education levels. More educated workers not only have higher wages and lifetime earnings but also see more rapid growth in their earnings. One study by Anthony P. Carnevale, Stephen J. Rose, and Ban Cheah of Georgetown University found median earnings growth for college-educated workers to be twice that of those with just a high-school degree over the past 20 years. Income inequality can also have an effect on economic mobility. As the rungs on the economic ladder get further apart and the wealthy have greater advantages to pass on, it becomes harder for others to move up. For example, research by economists Wojciech Kopczuk, Emmanuel Saez, and Jae Song, of Columbia University, the University of California, Berkeley, and the Social Security Administration, respectively, finds that mobility for male workers declined as wage inequality increased. Similarly, research by University of Ottawa economist Miles Corak finds that countries with less inequality have greater economic mobility. A fourth factor that may influence economic mobility is the income level of the economy. A rising tide may not lift all boats, but it does at least lift some. Specifically, research by University of Arizona sociologist Lane Kenworthy finds that incomes for low- and middle-income households are correlated with GDP per capita, or economic output per person. But Kenworthy also finds the most important factors for boosting incomes are “a combination of increases in employment, wages, and net government transfers.” Therefore, we are unsure if increased GDP per capita will necessarily boost economic mobility. The level of unemployment in an economy also affects economic mobility. Unemployment obviously affects current earnings, but a number of economic studies also find that unemployment can have a significant effect on a worker’s future earnings as well. An unemployed worker loses skills while off the job and they often have to take a lower wage when they do find a new job, resulting in lower wages and slower earnings growth. States with high levels of unemployment would be more likely to have lower levels of absolute and upward mobility. Economic mobility, in the broadest sense, is a measure of the movement of an individual’s income. Mobility can be measured over the course of a few years, the course of a lifetime, or even between generations of families. The Pew Center study focuses on economic mobility within one individual’s life; issues of mobility relative to earlier generations are not discussed. The report uses three different measures of mobility during the course of one career: absolute mobility, upward mobility, and downward mobility. Absolute mobility measures how much an individual’s earnings have increased over his lifetime. A person is considered upwardly mobile by the Pew study if they start in the bottom half of the national earnings distribution and move up at least 10 percentage points in the earnings distribution. Conversely, someone is downward mobile if she started in the top 50 percent of the national distribution and fell at least 10 percentage points. Pew’s data look at the earnings of individuals when they were between the ages of 35 and 39, and then when the same individuals were between 45 and 49. The first wave of observations happened between 1978 through 1997 and the second wave happened between 1988 and 2007. 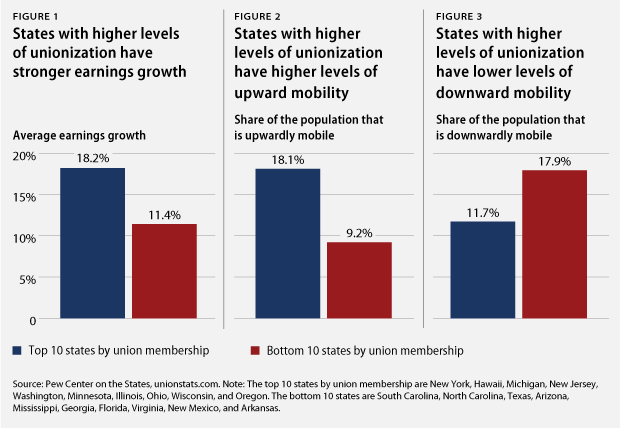 As the charts in this report highlight, states with high rates of unionization have greater absolute mobility and upward mobility and lower rates of downward mobility than states with lower unionization rates. 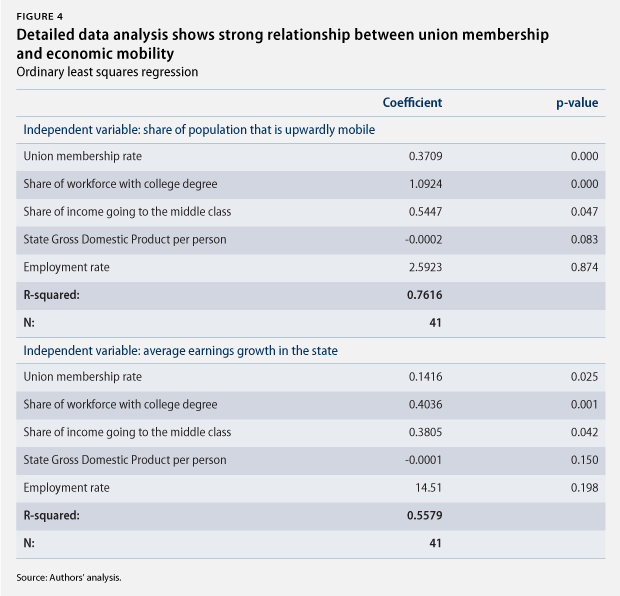 A more thorough multivariate regression analysis, which controls for other economic factors, still shows a strong link between union membership and mobility. Our analysis controls for each states’ education, economic inequality, average income, and share of the population that is employed. We measure the level of education by the share of the workforce that has a college degree, inequality by the share of income going to the middle 60 percent of households by income, and the income level by the state’s gross domestic product per capita. In order to compensate for the fact that the so called labor force participation rate—or the percentage of the population that is either employed or actively looking for work—affects measured unemployment, we use the employment rate, or the share of population that is employed, as our control measure for the effects of unemployment. Our results find a strong and statistically significant relationship between union membership and economic mobility. The simple relationship between union membership and mobility is statistically significant for all three forms of mobility: absolute, upward, and downward. The relationship between union membership and both absolute and upward mobility remain statistically significant when we add our controls, though the relationship between unionization and downward mobility becomes statistically insignificant when we add our controls. We find a positive relationship between the union-membership rate and upward mobility that is significant at beyond the 1 percent level. This means there is less than 1 percent probability the relationship is due to pure chance. Moreover, the results are substantively significant. A 10 percentage point increase in the union membership rate in a state would be correlated with a 3.71 percentage point increase in the state’s population that is upwardly mobile. If Missouri, for example, saw its union-membership rate increase to 20 percent from 10 percent in 2010, then we would expect the share of its population that is upwardly mobile to increase to 35 percent from 31 percent. That increase would put it just above the national average for upward mobility. The share of the workforce that is college educated is also positive and strongly correlated with upward mobility. A 10 percentage point increase in the share of workforce with a college degree would be correlated with a 10.9 percentage point increase in the state’s upwardly mobile population. Let’s use Missouri as an example again. Increasing its college-educated workforce to 29.4 percent from 19.4 percent in 2010 would be associated with an increase in the share of the upwardly mobile population to 41 percent. Missouri would then have a level of upward mobility similar to Oregon, becoming one of the most mobile states in the country. For our other control variables, we find a positive relationship between the strength of the middle class and upward mobility that is statistically significant at the 5 percent level. We also find a positive, but statistically insignificant, relationship between the employment rate and upward mobility. Finally, the data show no clear relationship between a state’s economic output per person and upward mobility, an unsurprising result given previous research. Indeed, the United States overall has seen GDP per capita increase as mobility has stagnated in recent decades. For those interested, more data on this regression and another looking at absolute mobility are available in Figure 4. In our efforts to boost economic mobility in the United States, we cannot afford to overlook the contributions of labor unions. Increased union membership is associated with higher income mobility, greater upward mobility, and lower downward mobility. Other policy options, especially increasing the quality and availability of education, are vitally important. But the contributions of unions are overlooked at our own peril. Rebuilding the strength of the union movement is critical to increasing economic mobility and restoring the middle class. David Madland is the Director of the American Worker Project at the Center for American Progress Action Fund. Nick Bunker is a Research Assistant with CAPAF.